Everest Base Camp Trek | Adam Tours & Travel Pvt. Ltd.
Everest Base Camp Trek considered getting you real close-up to the ‘King of all Mountains’ Mt. Everest [8848m], the highest mountain on the planet. If u like to walk, this is one of the most inspiring place in the world do it. The Mt. Everest Base Camp Trekking (16 days) is major trekking on the earth together and limitless chances to walk beyond Himalayas where Sir Edmund Hillary and Tenzing Norgay started their spirited journey on 1953. The ultimate challenge of Everest base camp trek offers breathtaking mountain panoramas and offers the widest and most exciting range of treks and also gives you the opportunity offering sceneries ranging from mountains, glaciers and famous mountain trails. Everest Base Camp trekking expedition highlights into the living of universal famous climbers and sensational mountain views and an insight into the lives of the Sherpa people. The journey of Everest base camp trek begins with exciting Himalayan flight to Tensing Hillary airport at Lukla from Kathmandu and trek up the Dudh Koshi Valley, surrounded by the soaring peaks heading towards the Namche Bazaar , capital of the Kumbu Sherpas, where we are again greeted by spectacular mountain vistas. We trek along a high traversing path where we have our first magnificent view of Everest and head towards Thyangboche Monastery. The monastery is located on a ridge top where a magnificent 360-degree panorama awaits with absolutely mesmerizing and stunning view of the Everest landscape. We then descend to the Imja Khola and continue to the villages of Pangboche and Pheriche before finally approaching the Khumbu Glacier. The hospitable Sherpas and their traditions, exquisite food and culture, you cannot help getting captivated and can enjoy every bit of it. The trail of Everest Base camp trekking in Nepal heads to Lobuche, a vantage point for some spectacular views of Ama Dablam, Taweche and breath-taking sceneries second to none. Going up the trails all the way to Kala Patter [5554m a viewpoint recognized as the best vantage point to see Mount Everest which is a premier goal for many adventurous walkers in the Himalayas.. Some marvelous views of the Himalayan giants literally numb your senses with breathless admiration that beholds the eye. This also includes fantastic views of the south west face of the colossal Mt. Everest. Lastly at the foot of Khumbu ice fall in Everest Base Camp trek we walk at our leisurely pace back to Namche and Lukla for our back down to take returning flight to Kathmandu. Day 03: Flight from KTM to Lukla and trekking to Phakding (2652m): walking distance 2-3 hours. Day 04: Phakding trekking to Namche Bazzar (3440m): walking distance 5-6 hours. Day 06: Namche Bazzar trek to Tengboche (3867m): walking distance 4-5 hours. Day 07: Tengboche trekking to Dingboche (4360m): walking distance 4-5 hours. Day 09: Dingboche Trekking to Lobuche (4940m): walking distance 4-5 hours. Day 10: Lobuche – Gorakshep (5170m) – Everest Base camp (5364m) back to Gorak shep (5170m): walking distance 6-8 hours. Day 11: Gorak Shep – Kala Patthar (5545m) and back to Pheriche (4280m): walking distance 6-7 hours. Day 12: Pheriche trek to Namche Bazaar via Pangboche and Tengboche (3867m): walking distance 7 hours. Day 13: Namche Bazaar trekking back to Lukla (2850m): walking distance 6 hours. Day 1:Greetings at Kathmandu Airport, 1320 m.
We will meet you at Kathmandu Tribhuvan International Airport and you will be transferred to hotel. When you have had your time to freshen up after your long fight, you will be invited to visit our office for a briefing about your program. You will have meeting with your trekking guide and discuss about the equipment needed for the trekking and we will process for the trekking permits. If you arrive at night we will have same discussion in next day morning after your breakfast. Day 2:A full day sightseeing tour of Kathmandu, the capital valley about 7 hour tour. Early morning we flight from Kathmandu to Lukla via mountain flight of about 40 minutes scenic flight. With clear weather we get spectacular views of the mountains, including Everest as we enter deep gorge of the Dudh Kosi valley. You begin your trek from Lukla, along the way you will have a view of Mt Nupla (5885m), Kusum Kangaru (6367m) and Kwongde Range. We then take an easy walk for about two hours to Phakding village for the overnight stop and rest of the time stroll around the village for local knowledge. The trail follows the Dudh Koshi valley north, meandering through the pines, crossing it twice by small suspension bridges before reaching the village of Monjo the entrance gate of the Sagarmatha National Park. Beginning with a slight climb to Jhorsalle, the trail passes waterfalls and other culturally and naturally occurring items of interest. You will be rewarded with your first glimpse of Kusum Kangru (6369m) Thamserku (6608m), Everest (8848m) and Nuptse (7879 m). A steep climb up to the beautiful village of Namche bazaar (3440m) will afford you further spectacular views and a comfortable place to spend the second night of the trek. Set in a natural amphitheatre looking across to the jagged ridge of Kongdi Ri(6187m), Namche Bazzar is one of the most attractive settlements in the khumbu region. We will have a full day rest so that we won’t face any problem ahead. Today we make a short acclimatization trek up to Khumjung, a delightful Sherpa village above Namche. You have full day leisure for wonderful panoramic view or stroll around the market You can also enjoy the splendid views of Everest, Ama Dablam, Thamserku, Nuptse, Lhotse, Tawche, and Kwangde and so on. After lunch our adventure continues towards Everest Base Camp Distance 3.5 km one way. The trail passes through over rocky dunes and moraine and streams. The Base Camp area provides an opportunity to experience the freezing and harsh conditions that mountaineers brave to summit this famous mountain. 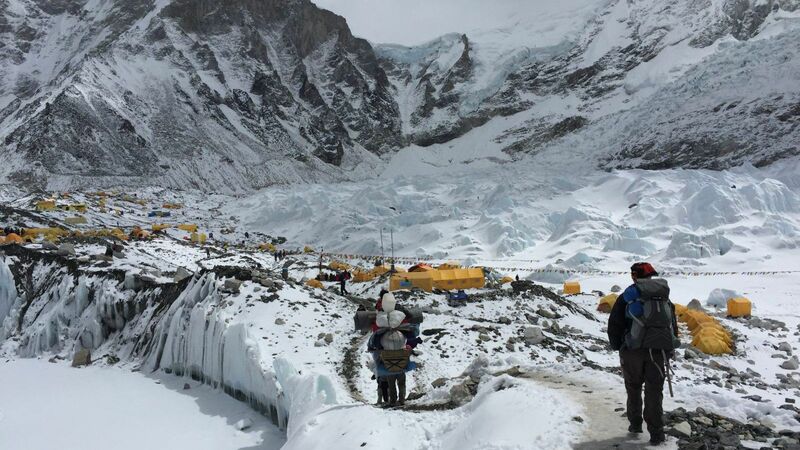 In Everest Base Camp the climbers gather for summiting Everest during the high expedition season. We explore base camp and its surroundings glacier and return back to Gorakshep. Mornings are usually sparkling and clear and this is the best time to climb the Kalapathar ( about 2 km one way) for one of the world’s definitive mountain views. We will be rewarded the 360 degree dramatic panorama views of Mt Everest and surroundings mountains like Mt. Pumori, Mt. Lingtren, Mt. Khumbetse, Mt. Nuptse, Mt. Lhotse, Mt. Ama Dablam, Mt. Thamserku along with many other peaks. We will trek down through the hillside blanketed by rhododendron and juniper trees. It Takes approximately four hours to Tyangboche. It is a small village with a famous monastery offering you splendid views of Mt. Amadablam, lush green hills and river views. The descent from Namche to the Dudh koshi can be the hardest stage of the entire trek. Although the path is all downhill, the unrelenting slope places massive impact on the knees. Once you cross the high suspension bridge, the path runs mostly level. We will work though rhododendron and pine forests with the view of distance snow covered peak before arriving Phakding. Enjoying the lush green scenery around and passing through the incredible mountain scenery and local Sherpa village arrival in Lukla. You’ll have time to stroll around the local areas. Best Travel Time: February to Mid June, September – Mid December are the best seasons. Dec & January are Winter and cold can be snow on the trail, July & August are rainy time, trekking can be done but visibility can be poor due to rain..